After his French success, Pauling traveled to England where he toured protein laboratories, talked with his critics, and, as usual, enjoyed himself. There was now growing evidence of the presence of at least some bits of alpha helix in a number of globular proteins; data supporting the presence of his pleated sheet structures was also mounting. Pauling started thinking about how his spirals could bend and fold to form the denser, more spherical globular proteins. While visiting Bragg's labs at the Cavendish, Pauling met a bright and talkative graduate student named Francis Crick, who was interested in many of the same things Pauling was, from DNA to the question of why Pauling's alpha helix did not produce the 5.1 angstrom reflection found in Astbury's keratin research. Crick was also interested in garnering a postdoctoral fellowship at Caltech. He and Pauling talked about both matters during a car ride around Cambridge. Crick, during the discussion, hinted at a pet idea that he'd been nursing: "Have you thought about the possibility," he asked Pauling, "that alpha helixes are coiled around one another?" Pauling, who had been considering a number of higher-level schemes for his helixes, including some where they wound around each other, remembered answering, "Yes, I have." Crick, however, later could not remember Pauling giving any indication that he had been working on the problem at all. Whatever the case, Pauling returned to Caltech and started working harder to explain the absence of the 5.1 angstrom reflection. With Corey's assistance, he worked out a way that his alpha helixes could be wound, like a piece of yarn around a finger, into a sort of coiled coil that could, at long last, produce the missing reflection. He then took the idea a step or two further, imagining ways that coiled coils could snake around each other to form cables made from different numbers of strands. Natural keratin, the kind that gave Astbury-like patterns, could be twisted together from helical ropes. Crick got a heads-up on Pauling's work before it was published from Pauling's son Peter, who at the time was working in the same group at the Cavendish. Crick's first thought was that Pauling had stolen his idea. He went to work immediately fleshing out his original idea, which he summarized in a short note to Nature on October 22. It arrived just a few days after Pauling's longer manuscript on the same topic had reached the same journal. Crick's brief note, however, was published first (short notes are often published faster than longer, more carefully reviewed papers), and for a few weeks there was grumbling about priority on both sides of the Atlantic. Finally, however, the Cavendish crew admitted that Pauling's paper went considerably farther than Crick's and a sort of gentleman's agreement was reached that both parties had independently come to the same general conclusion. The important fact for Pauling was that a major question mark had been erased and the alpha helix and pleated sheet structures were becoming seen as real, accepted not only as the major players in fibrous proteins, but also, in varying degrees, as components of globular proteins. Pauling's other proposed structures might be wrong, but these were enough to ensure his place among the greats of protein research. The coiled-coil episode would mark the end of Pauling's most active phase of protein research. Now he turned his energy toward another prize that Crick was also after: DNA. See Also: Letter from Alexander Todd to Linus Pauling. February 10, 1953. 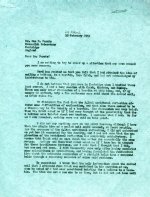 See Also: Letter from Linus Pauling to Alexander Todd. February 19, 1953. 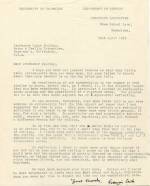 See Also: Letter from D. P. Riley to Linus Pauling. June 8, 1953.